The linear features in this area of the Moon are part of the ejecta deposit of the Imbrium impact basin, which is located roughly 1500 kilometers to the north and formed 3.85 billion years ago. This texture is called Imbrium Sculpture and was first interpreted as an impact-related feature by G. K. Gilbert in his telescopic observations of the Moon in the 1890s. These radial grooves are caused by the collision of massive quantities of broken rock ejected from large impact basins with the surrounding surface. 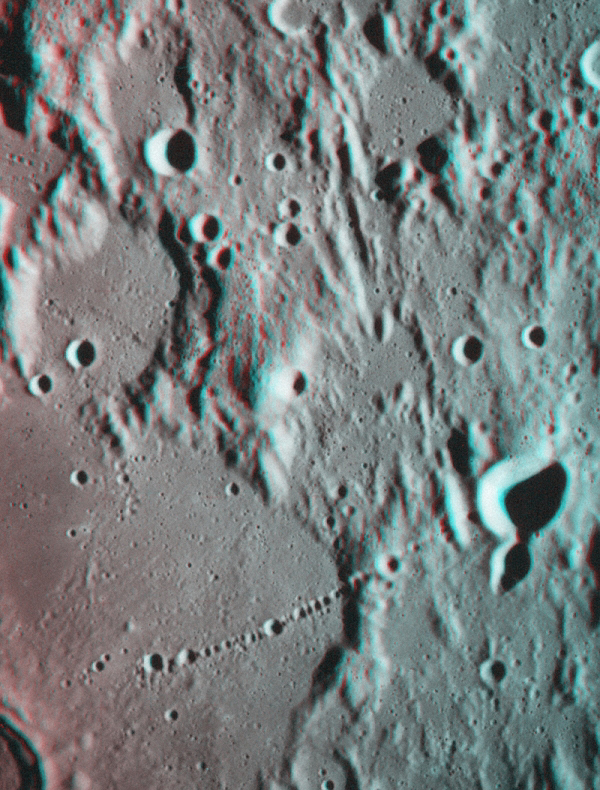 Ejecta of this type surround Imbrium and devastated or disturbed almost half the lunar surface. Despite this, the degraded rims of several large and older impact craters are visible. These craters have smooth dark floors and were partially filled by mare lava plains associated with the nearby Mare Nubium. The unusual chain of craters at bottom, called Catena Davy, may be a chain of volcanic craters or a chain of secondary craters formed by the large Orientale impact basin located 2000 kilometers to the west. Alternatively, it may have been formed by the impact of a comet similar to Comet Shoemaker-Levy 9, which split into numerous fragments in 1992 and struck Jupiter in 1994. In this case, it was an encounter with Earth that disrupted the hypothetical comet. The largest craters in Catena Davy are 3 kilometers across. Apollo 16 images AS16-M-1676, AS16-M-1678.